What do we really mean by phrases such as “western Canadian political culture,” “the centrist political culture of Ontario,” “Red Toryism in the Maritimes,” or “Prairie socialism”? What historical, geographical, and sociological factors came into play as these cultures were forged? 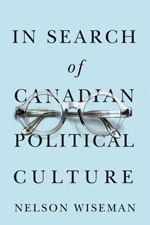 In this book, Nelson Wiseman addresses many such questions, offering new ways of conceiving Canadian political culture. The most thorough review of the national political ethos written in a generation, In Search of Canadian Political Culture offers a bottom-up, regional analysis that challenges how we think and write about Canada. It will interest specialists in Canadian political culture and generalists in Canadian politics.